The instantly recognisable silhouette that greets visitors to Sellafield has long stood out as a potent symbol of perhaps the most despised industry in Britain. Ever since the fire at the Windscale nuclear reactor in 1957, the industry has had to face profound hostility and loathing, fiercely voiced both by environmental campaigners and by some of Britain's neighbouring governments. But Sellafield's image could be about to change, as the concrete monstrosities that spoil this otherwise idyllic Cumbrian beach will soon be flattened. The "golf ball" will be knocked off its perch and controlled explosions will demolish the enormous concrete cooling towers . Once the dust settles, it should become clear that the changes currently taking place at Sellafield and Windscale amount to much more than a cosmetic exercise aimed at giving the site a streamlined facade. The sprawling Sellafield site, where many a decaying building lies dormant, feels a bit like a museum of Britain's nuclear heritage. Energy calculator: nuclear, fossil or renewable energy? The UK's first commercial nuclear power station, Calder Hall, which was opened by the Queen in 1956 and stayed in operation until March 2003, is still standing tall, though its operations have long since ceased. The solid waste storage silo B41 is still full of intermediate waste, waiting to be emptied and decommissioned. The B203 plutonium purification and residue recovery plant has not been operational since 1987. The uranium purification plant closed in 1973. And the absolutely huge Magnox storage and decanning facility, which was operational for 30 years, was closed down in 1992. But these "historic" buildings are not museum pieces. The reason why they are still here is simple: removing them is both tricky and expensive. Yet, with decommissioning of Britain's old nuclear installations gathering pace, industry operators are preparing for a golden handshake as they bid Britain's old nuclear industry farewell. Vast, long-term contracts could soon be up for grabs if the government green-lights a proposal tabled by the Nuclear Decommissioning Authority (NDA). The plan could create a new clean-up industry in the UK worth just short of £100bn, including waste from Britain's nuclear weapons industry. The clean-up bill from half a century of civilian nuclear activity accounts for about £72bn of that, with well over half expected to go towards cleaning up Sellafield, the latest figures from the NDA show. In short, says one industry official: "There's going to be some big contracts, of which Sellafield is going to be the biggest." 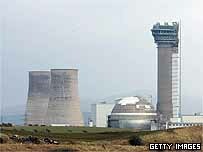 Up to now, the bulk of Britain's nuclear waste has been stored above ground at 37 sites across the UK. When measured by volume, 65% of Britain's total waste mountain is stored at Sellafield. Unlike in many other countries, which tend to favour deep underground depositories, the nastiest high-level waste is kept in a somewhat tall yet ordinary-looking warehouse. The waste, left over from the reprocessing of spent nuclear fuel rods, has been converted from liquid to solid glass by temperatures of 1,100 degrees Celsius. It is so radioactive that it continues to generate heat for five decades. 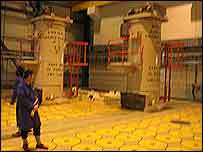 The waste is stored in stacks of 10 small steel cylinders the size of milk churns, that are in turn sealed into place by two-metre deep yellow shielding plugs. The whole storage facility covers an area similar to that of a football pitch that is shielded by thick, solid concrete walls. By volume, it accounts for just a tenth of a per cent of total nuclear waste in the UK, though it accounts for 95% of the radioactivity. "You're standing on one of the most concentrated sources of radioactivity anywhere in the world," says BNFL spokesman Neil Stagg. The bulk of Britain's nuclear waste - 470,000 cubic metres in total - is classified as intermediate: nuclear fuel casings, transport containers, reactor cores and even the remains of torn-down buildings. Much of it is here at Sellafield, although in July, the Committee on Radioactive Waste Management will publish recommendations for how to deal with it in the long term. By comparison, the sprawling low-grade waste repository of Drigg, a few minutes drive from the main Sellafield site past the small Seascale fishing village, is "only slightly radioactive", says Mr Stagg. 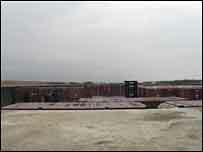 There are rows upon rows of containers, stacked and sealed with cement, ready to be buried and grassed over. They contain a mixture of hospital waste, building materials, wrapping material that has been exposed to radioactivity, and even contaminated soil. This flat and windswept beach landscape is about to become a battleground as companies begin to fight over clean-up contracts. Next month, a £1bn contract to clean up Drigg is going out to tender. Current operator BNG is the expected favourite, and this should stand it in good stead when much larger clean-up contracts come up for grabs. "If you're the first-tier contract, you run the site," observes one industry official. But BNG may have to share the spoils with others. On one level, there is a string of UK firms like Serco, Carillion and WS Atkins lining up to provide services. "It's a big market and the Americans are keen to get involved," the industry official says, pointing out that in most cases, they are vastly more experienced than their British rivals. Among BNG's leading contenders are the experienced US clean-up firms Fluor and Shaw. But there are others too, most notably CH2M, which has teamed up with the UK engineering group Amec and with the government body UKAEA. Bechtel is also expected to bid for clean-up contracts, though it cannot do so during the early stages as it helped create the NDA, which will be awarding the contracts during the next five years. Investors ranging from big institutions such as pension funds and insurance companies to smaller private equity firms are also eager to get in on the act. In part, this is because of the predictable long-term nature of the contracts the NDA is expected to award. As an added bonus, those involved in cleaning up the old waste might be first in line if the government decides to sanction the building of new nuclear power plants. It is becoming increasingly clear that the nuclear industry's survival does not merely hinge on whether or not the public will stomach the proposed revival of nuclear power. This is the second of two features exploring the way the nuclear industry is changing. The first feature was published on 28 March.